Any business that has clients, suppliers or operations elsewhere in Africa will encounter and have to manage the possible drawbacks of dealing with forex. These types of businesses range from smaller importers or exporters to the more obvious examples of large listed retailers, including Shoprite Holdings, Pepkor Holdings (previously Steinhoff Africa Retail) and Massmart. 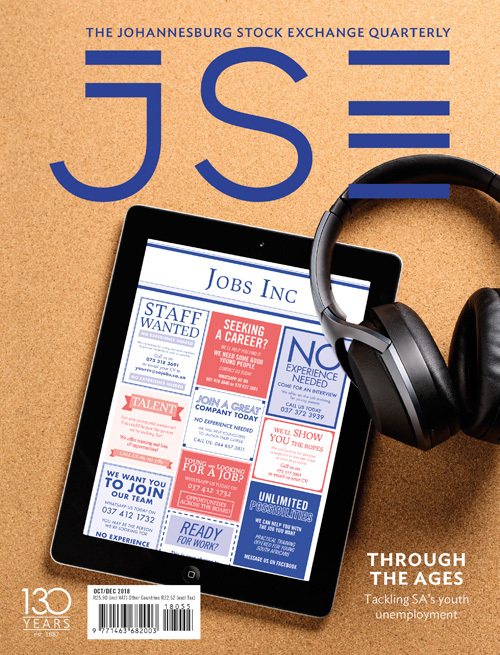 For a group such as Sasol, currency rates – in particular the rand/US dollar exchange rate – have a direct and material impact on revenue and, importantly, profitability. 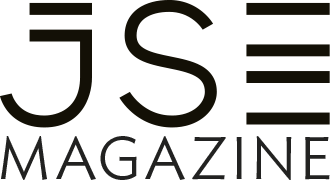 Last year, it estimated that a ‘10 cent change in the annual average rand/US dollar exchange rate will impact [its] operating profit by approximately R710 million in 2018’. The simplest way for any business to manage forex risk is through hedging (practically all large listed entities hedge their forex risk and account for this in their financials). 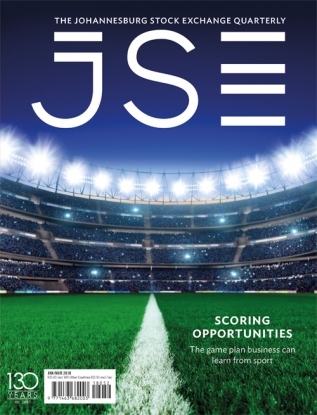 Wichard Cilliers, chief dealer at TreasuryONE, explains that the objective of hedging is simple – ‘to create stability and predictability and fight volatility, uncertainty and complexity’. He adds that forex hedging contracts ‘provide you with certainty for a known period, allowing you to control your cash flow. Cash is king, after all. Another key reason is to protect profit margins. 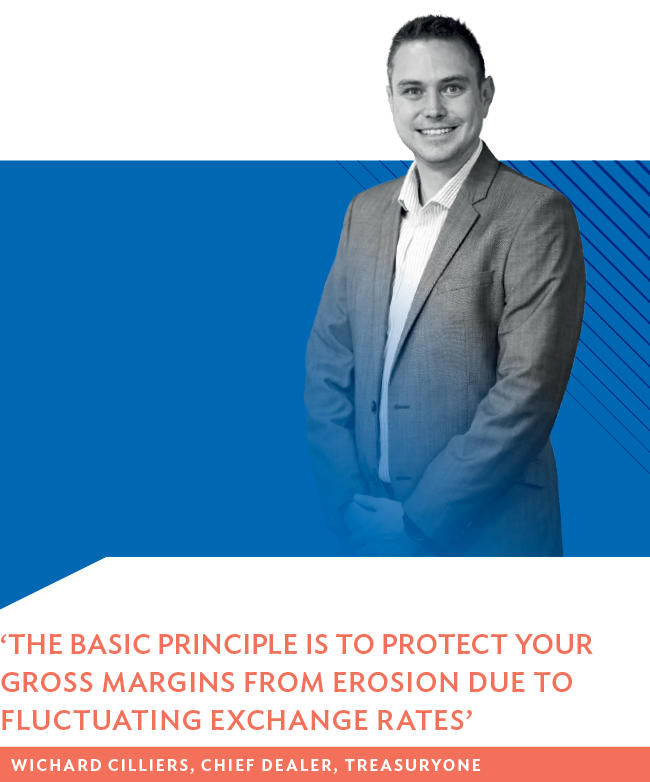 The basic principle is to protect your gross margins from erosion due to fluctuating exchange rates, especially where the margin is tight’. Aside from protection from volatile and erratic currency movements, liquidity is another key reason for hedging. 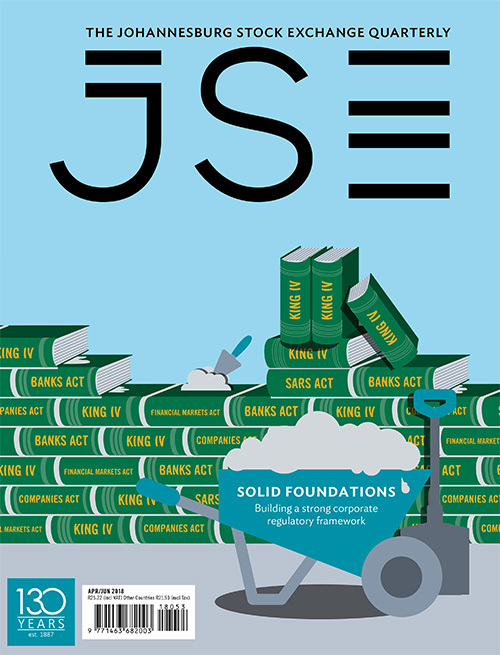 Financial risk management consultancy JCRA Group notes that while the rand is the most liquid of all sub-Saharan African currencies, the size of the market remains small by global standards. ‘The largest market of any kind in the world, turning over more than $1 trillion per day, is the euro/US dollar market.’ The spot US dollar/rand market, in contrast, ‘turns over only around the equivalent of between $5 billion to $7 billion daily. 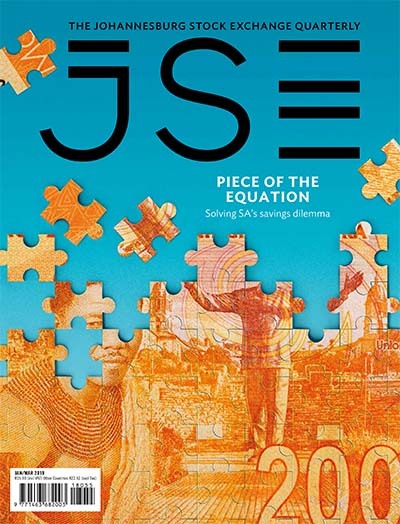 All other sub-Saharan African currency markets are less liquid than the ZAR – most considerably so’. 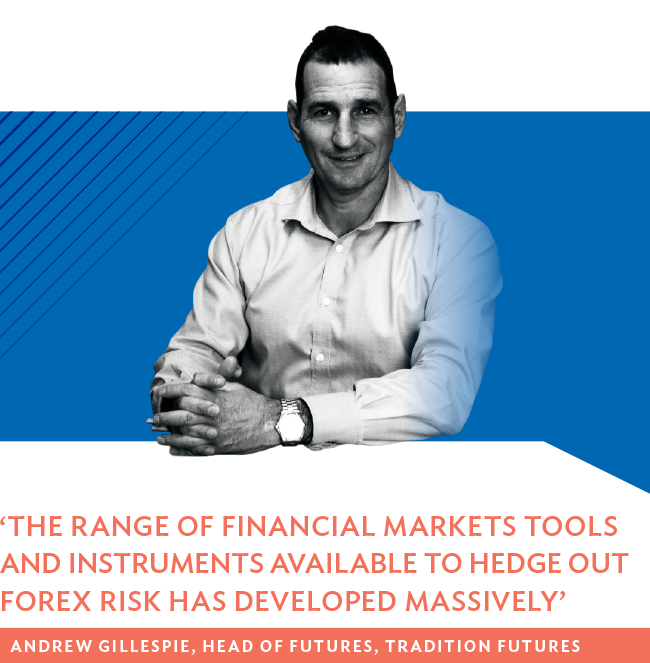 Andrew Gillespie, head of futures at Tradition Futures, says ‘the range of financial markets tools and instruments available to hedge out forex risk has developed massively over the last 10 to 15 years’. ‘The most common mechanism or hedge, however, remains the taking out of forward foreign exchange cover: in essence, securing a defined and guaranteed rate for future dated exports or imports,’ he says. In simple terms, a business will agree to buy or sell a certain amount of foreign currency on a specific future date at a predetermined exchange rate with an approved counterparty, generally a bank. 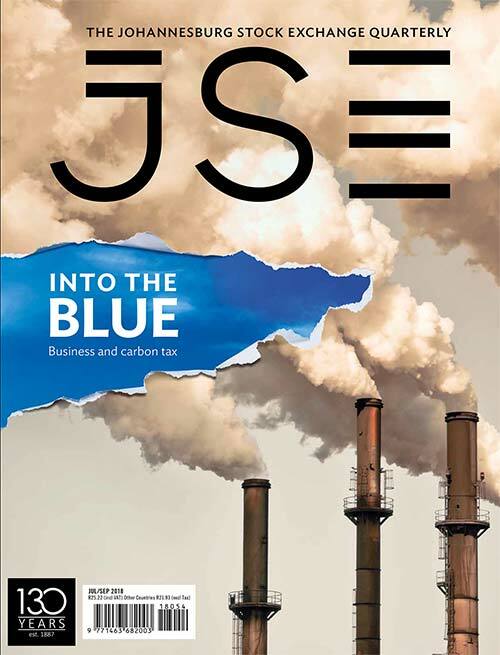 Cilliers adds that another way a business can hedge risk is via the derivative market, where a large number of different products can be used. These markets are typically more transparent, and provide price discovery, liquidity and a level playing field. Here, ‘the principle remains the same in that the rate is set for a specific future date’. He says the most common time frame that businesses typically hedge for is within the next 12 months. Gillespie explains that the greater the sophistication and maturity of the financial system in any currency or country, the more accurate and detailed the forex hedge. This is particularly true when it pertains to tenor and credit. Entry and exit risk exists when hedging, but it is relatively easy to mitigate. JCRA notes that ‘hedging medium-term holding risk – that is, the risk run over the duration of the investment itself – presents more of a challenge. The first thing that surprises many is that when looking to hedge an emerging market currency back into US dollars, it is rarely possible to achieve a hedged rate that is close to the spot rate. This is due to the fact that the interest rates of the currencies concerned are invariably higher, and often very substantially so, than US dollar interest rates, leading to a forward curve in which the US dollar trades at a premium – and the foreign currency at a discount – to the spot rate’. The US dollar is central to the entire market of foreign exchange hedges. It remains the world’s main reserve currency, and the bulk of international trade and commodities is invoiced and priced in dollars. But, Gillespie says this is changing, as ‘sophisticated intermediaries such as exchanges and banks provide specific country hedges, cutting out the – sometimes – unnecessary and expensive loop of always going via the US dollar’. In Africa, for now at least, the dollar remains the main currency that local currencies are hedged against, says Cilliers. However, there are some countries where the payment or transfer of profits/dividends are not in dollars, but the local currency. This is because of limitations by central banks as well as the limited availability of products within (relatively underdeveloped) forex markets. Still, currency units of African countries are notoriously volatile, opaque and often subject to capital controls, with little ability to hedge against these factors efficiently or at a fair cost. ‘All of these characteristics are a massive barrier or impediment to doing business on the continent, both for in-country economic agents and the international business community,’ says Gillespie. He adds that the frictional expenses of hedging forex risk in Africa, such as bid/offer spreads, bank charges and settlement costs, are compounded by the interest rate differentials inherent in many African countries, ‘making hedges versus domestic currency depreciation versus the US dollar prohibitive’. Yet this backdrop, he says, is changing and evolving, as the financial sophistication and modernisation of the foreign exchange markets in Africa evolves. 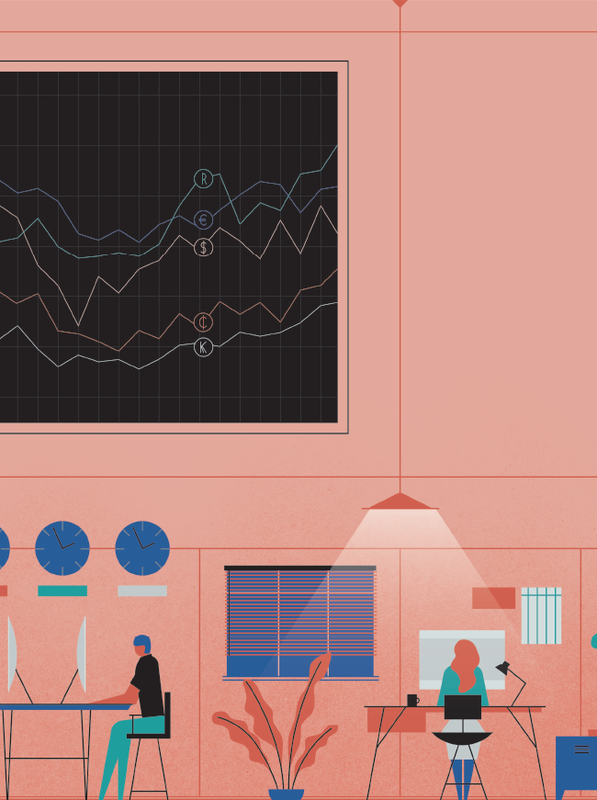 ‘Transparency is improving, as is liquidity in some of these markets, as well as the range of platforms and counterparts with whom to trade and hedge out risk. In a white paper, JCRA argues that hedging should not be confused with blindly ‘locking in’ a rate with forward contracts.